The term leaf usually means an organ of a vascular plant. 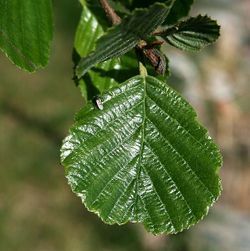 Many leaves are large, flat, green structures above ground, involved in photosynthesis. A leaf consists of a blade and a petiole, which sometimes have stipules at the base, and has a bud in the axil between the petiole and the stem unless there is no petiole as in the case of sessile leaves. However many types of leaves lack one or more of these general characteristics. Some leaves are not flat like the conifers, some are not above ground like the bulb scales and some lack major photosynthetic function like the spines. The leaves may have functions other than photosynthesis. Some leaves provide protection, support, storage and even acquisition of nitrogen. Leaves are made of various types of plant tissues, some serving as support and other serving as filler material. ↑ Schooley, James (1997). Introduction to Botany. Albany: Delmar Publishers. p. 307. ISBN 0-8273-7378-3. ↑ Mauseth, James D (1998). Botany: An Introduction to Plant Biology (2nd ed.). Sudbury, Massachusetts: Jones and Bartlett Publishers. p. 144. ISBN 0-7637-0746-5. ↑ Michael Levy, ed. (2008). Plants, Algae and Fungi. Chicago: Encyclopaedia Britannica. p. 16. ISBN 978-1-59339-803-3. This page was last modified on 30 August 2013, at 17:15.